So the new semester’s in full swing, or just about. After more than two months of the most frustrating non-routine, I’m more than happy to be doing some actual work again. My new schedule is awesome. No, I mean it’s really awesome. Let me explain. Native English Teachers in the public school system (that’s me) are required by law to teach 22 classes a week. Classes are 40 minutes each with a ten minute break in between. If you need to teach any more classes (up to a maximum of 28), you get overtime pay. There’s an hour lunch (mine’s from 12:10 – 13:10). And for reasons of safety and whatnot, we’re required to be at school from 8:30 to 16:30 daily. Classes start at 9:00. This semester I got a new schedule. Hellz yeah! My classes are slotted in back to back, starting at 9:00 every morning. I’m mostly done by lunch time at 12:10, and on Tuesdays and Thursdays I have one class after lunch and it finishes at 13:50. I mean c’mon, is that the best schedule or what?! It gets better. Because our school is rather new, it has expanded quite a bit. This means that my entire schedule is filled with syllabus work (grades 3 – 6). No daycare, no reading classes, no phonics, and best of all, no kindergarten. Don’t get me wrong – kindie was fun, but I just wasn’t designed with the energy levels necessary to be a kindie teacher. I enjoyed it, but I wasn’t very good at it. I mean, it’s a far, far cry from high school maths. So to find out that I don’t have to deal with those extra classes (which happen to be the co-teacher-less ones where the kids go wild) was so relieving. My new co-teacher also told me that the principal doesn’t want me to teach any extra classes this year. I don’t know if that’s an insult, but I’m super happy about it. I’ve since discovered that a contract teacher comes in and does supplemental English lessons. During that time I stalk people on Facebook. Fair trade methinks. So, schedule-wise, I’m happy. I have all afternoon, every afternoon, to be as productive or vegetative as I want. Prep work takes mere minutes (seriously, those textbooks aren’t exactly rocket science, and hey, turns out I can read and correctly pronounce all the key vocab ~ win!) and then it’s just me and the interwebz. But I know you’re just reading this to find out why I’m scheduling my toilet breaks. Right, in the previous bit I mentioned kindergarten. And like I said, I enjoyed it, but I wasn’t very good at it. What made it worth it, though, was the kids. Well, most of them. OK, some of them. A few of them. One tends to find unique ways to build relationships with kids (all people, really) when you don’t have a language in common. I mean, we had the five new words I’d just taught them, but the colours of the rainbow and the numbers one to ten only get you so far if that’s all you know. As a result, there was a lot of unique communication. This involved a lot of body language – them hugging me, hanging onto my extremities for dear life, lots of hair touching and face touching and well, any bit of exposed European skin, really. One tried poking her finger in my eye once. That was weird. They’d slip my phone out of my back pocket and take photos of themselves and each other and return it without with very self-satisfied looks. I could keep them occupied for most of a lesson by doing the Gangnam Style dance. Another trick was reciting my Korean vocabulary repertoire. One bow and “annyeong haseyo” and they were mine. So English aside, we had a lot of fun together. And for that reason, I was *a teeny tiny bit* sad that I wouldn’t have that anymore. But where a door closes, a window opens. See, to walk from the English classroom to the staff toilets, I need to walk past the three grade 1 classrooms. And guess who’s in grade 1 this year? You got it! And if I time my breaks just right (in other words, in the ten minute gap between classes), they’re out in the corridors looing and drinking water and washing hands and being kids. And every day – EVERY DAY – is like a great reunion. As soon as they spot me, they come running, ready for high fives and hellos. The ones who know me from last year latch onto me and don’t let go until the last possible minute. The ones who came from other schools were quick to join in on the fun and share with me their English repertoire. One girl’s lines include (whether I’ve greeted her or not), “Nice to meet you, too. What colour do you like?”. One of my favourites from last year (I’ve blogged about him), makes little horns with his fingers and storms away, shouting “I’m angry”, regardless of his mood at the time. A certain group of girls start saying Korean words (the ones they know I know) and giggle like children (yeah I know) when I repeat them. Another group bows and greets me, and practically cry with laughter when I do the same. After a few minutes of spreading the foreigner joy, I attempt to enter the toilet. Now, you know that scene in <insert name of zombie movie here> where the damsel-in-distress runs into a room and tries to shut the door on the zombies while the bang and scratch away? Now, replace the movie name with “toilet break”, picture me as said damsel and instead of zombies, the cutest kids you can imagine. I’m yet to figure out why they don’t just come inside. Thank goodness for respecting the rules. And now I have no idea why I took the time to type out this story. Oh well. I’m having so much fun building relationships with these kids. A lot of them are now confident enough to speak to me, and many will drag friends along to translate for them if need be. I have nicknames for many of them (and now that I can read Hangul it’s a lot easier to learn their names). Before and after class, many will come up to me and quiz me on their names, or teach me one or two new ones. I can keep them entertained for ages by switching their names around, or swopping the syllables around, or calling them by my name. Last year, I christened one of my daycare kids ‘Tongajelly’ (which is how he pronounced “Tom and Jerry”). I used T&J as a reward if they all finished their tasks in good time. Tongajelly would come into the classroom, already whining for Tongajelly. He went through a few weeks of refusing to do anything else, sulking away while crumpling up worksheets or just sitting there. The sweetest part was when he saw that his classmates were having fun and enjoying the activity – he’d flatten out the piece of paper and do whatever activity, all the while whining for Tongajelly. He didn’t realise that this was his nickname for the longest time, and when it finally hit him, he was so bashful. It was clear that he valued being singled out, but didn’t like a big deal being made of him. This year, he’s in grade 3, so he’s in formal English classes. He’s turned into such a lovely kid. He chooses to sit in the front of the classroom, and he’s one of very few who have been on top of things since the very beginning. He participates like few others and he is just generally an awesome kid to have around. He’s picked up that I’m learning names as I go along, and he makes a point of telling me his name whenever he gets the chance. I’ve known his name for ages, so I comfortably switch out different syllables with ‘Tongajelly’ whenever we speak. One day soon it’ll wear off, but until then, Kim Dong Tongajelly will provide endless entertainment. It’s moments like these that help me get through the day. I can’t exactly make small talk with the kids, so mucking up their names is about the best I can do. And as long as they smile and come back for more, I have no plans to change this. Any teacher would tell you that there is never a dull moment when it comes to the classroom. Yes, there are those moments when you want to pull out your hair, but thankfully these are nicely neutralised by the times you can only smile and nod. Maybe even shake your head to disguise a smile that really shouldn’t be spreading across your face. Two weeks ago, I commented on Facebook about teaching my daycare group the days of the week. Daycare consists of grades 1 and 2, so their English is just starting to take root – more so if they attend private tutoring (hagwons or academies). A lot of them have been exposed to some level of English and their vocabulary is steadily growing, but pronunciation… oh, pronunciation, you evil, evil thing! Back to daycare. So we’re going through the days of the week. As any Christian would, I naturally started with Sunday (so does the song they learned, so don’t you come lecture me). I say the day, they repeat after me. Easy! Sunday. Sunday. Monday. Monday. Tuesday. Oh dear. Chooozday is about as close as they get. I’m good with that. For some, it’s their first try. Wednesday. Wennnnnnsday. I try and get them to pronounce less of the letter ‘n’, but no luck. We move on. Thursday. First-day. I let this one go. I’m just happy it’s not Pirst-day; at least we’re getting somewhere with phonics. Last one. How bad can it be? I’m all nice about it and break it up into syllables. Sa. Tur. Day. I make them say each syllable individually. No problem. Right? So let’s put them all together. Saturday. Sexurday. Saturday. Sexurday. Sa. Tur. Day. Sexurday. Over and over and over. Eventually I gave up, started singing a random song, just so it would be appropriate for me to break into a very entertained laugh. Since then, we’ve made progress. Not only do they know the order of the days, but they can pronounce them well (for the most part). Though I’m sure many would agree (and in fact many did on Facebook), Sexurday is the best day of the week! Today something happened that stood out, too. On Wednesdays I teach two kindergarten classes. Not my favourite part of the week by a long shot. 30 little kids running around (seriously, as soon as one is contained, five more jump up and go nuts). No English. No co-teacher. And they hit one another. And cry. All the time. I don’t do crying kids! In the younger group, there’s this boy. The first time I saw him, I pegged him as, well, an energetic specimen. Spot-on. This kid doesn’t walk. He hops. He doesn’t run. He dances. He doesn’t sit. He momentarily pauses before embarking on his next adventure. He’s a little bigger than the rest of the class, and a lot more confident, so I think he may be a year older. Not important. This kid. I never leave in a bad mood. Whenever he sees me, he breaks out into his English repertoire. What makes it all the more amusing is his clipped accent. And his hand gestures. With each phrase he gestures with a pointed finger, almost like he’s scolding me. Just cuter. Today he was walking around with four pieces of paper: pink, blue, green and yellow. He showed them to me. Instinctively, I threw in an impromptu lesson. Me: Ooh, different colours! Give me blue. Him: Hello. How are you? I’m fine. Me: No, I mean the yellow paper. Ye. Low. Four or five times. Of course I was just having fun, so I rung it out a little. I get to do these things, because they make me smile and remember that I love my job. I’ve decided to kick it off with a post about the school where I work, seeing because, well, I’m at work. Now those of you who stalk me on Facebook will know that I have an album dedicated to my previous job. It’s called “Why I show up every morning.” Turns out I have a new reason to show up every morning… Scrap that, I now have no reason not to get up. I’ve never been a morning person (understatement, right?! ), and I’ve always feared kickin’ it on my own. What if my mom doesn’t nag me to get out of bed? Forget wake-up calls – it’s roughly 2am in SA when my alarm goes off. (Note how I used 2am and not 02:00. I’m losing my roots!) Turns out that waking up is a lot easier when you don’t mind going to work. Now, early days, I know, and I anticipate that some of the novelty will wear off come winter, but fundamentally, I love my job. The school is awesome, my colleagues are awesome, my co-teacher is awesome, and, I’ll admit, with time I’ll even find the food awesome. I don’t even know where to start, so you may as well go get some coffee. And cake. This is going to be a long post. What you’ve read so far is only the introduction. Let’s kick off with an explanation of the foreign teacher/co-teacher thing. I am the foreign teacher, or native English teacher. My co-teacher is the Korean teacher who is the main English teacher for the school. At Elementary School level, teachers teach all the subjects to their own class (as is done in SA), but English (along with Music and Science) is specialised. The co-teacher is (supposed to be) fluent English (mine is! ), and the foreign teacher’s role is to help with the smaller nuances, like inflection, pronunciation and all that stuff. The co-teacher and foreign teacher are supposed to share the load as far as doing lessons are concerned. More on that later. Right. The school. Now, to set the scene, let me explain that it’s about a 20 minute walk from my apartment to the school. It’s a lovely walk. I walk past lots of greenness, and lots of students, as the middle and high schools are across from my apartment. This is where my good day starts. I am always amazed at how, despite having variations to their uniform and dressing very individualistic, they still look neat and presentable. The boys’ uniform has skinny pants. 🙂 I also enjoy how they step out of the way when coming from up ahead, so that I have a straight path ahead. This sort of respect is evident everywhere. I won’t mention that it’s because of my age, as that is not what this post is about. My age is just fine, thank you very much. As soon as I turn the corner near my school, kids start noticing me. They then come running, with an enthusiastic “hi teacher”, “hello”, “herro”, “how. are. YOU.” or just to wave and run off. Who can be grumpy after that? Then, as I approach the building (which is where everyone changes into their “inside shoes”), the kids scramble to get out of the way so that I can walk inside. Imagine a learner in SA stepping out of the way so a teacher can pass… Yeah, I couldn’t either. Once inside, and in my comfy inside shoes, I take the elevator (lift, damnit, it’s a lift!) to the 4th floor. There are three roomy flights of stairs, but I like to look in the mirror on the way up. My classroom is on the 4th floor, which is what we know as the 3rd floor, as over here there’s no ground floor – they start at 1. As soon as I step out of the lift, kids start greeting me again. Students have to be in class at 08:30. At 08:20, a bell rings, and then the ones who are still outside start running in. It’s amazing. When the 08:30 bell goes, there’s not a soul in the corridors. Double amazing. I’m assuming there’s a type of register period from 08:30 until 09:00, as that is when I start teaching. Back to the register period. There’s no assembly here, or staff meetings, except for special occasions. Each classroom is kitted out with a (very fancy) TV, and there is a broadcast room downstairs. Not bad, eh? I have an awesome schedule. I will have some conversation classes added at a later point, but for now I have most afternoons off. I teach grades 3 – 6 as well as kindergarten, and take grades 1 and 2 for aftercare. So I teach the whole school! Can’t wait to start learning names. The kids here don’t have English names, so I have a massive challenge ahead of me. Hmmm… finer details: each period is 40 minutes long, with a 10-minute break in between, to finish up if you haven’t and to give teachers a break (a what???) before the next class. Lunch is at 12:10. It’s an hour long and teachers and students all eat in the cafeteria. Lunch is lunch, no staff meetings, no dealing with student matters, just lunch. 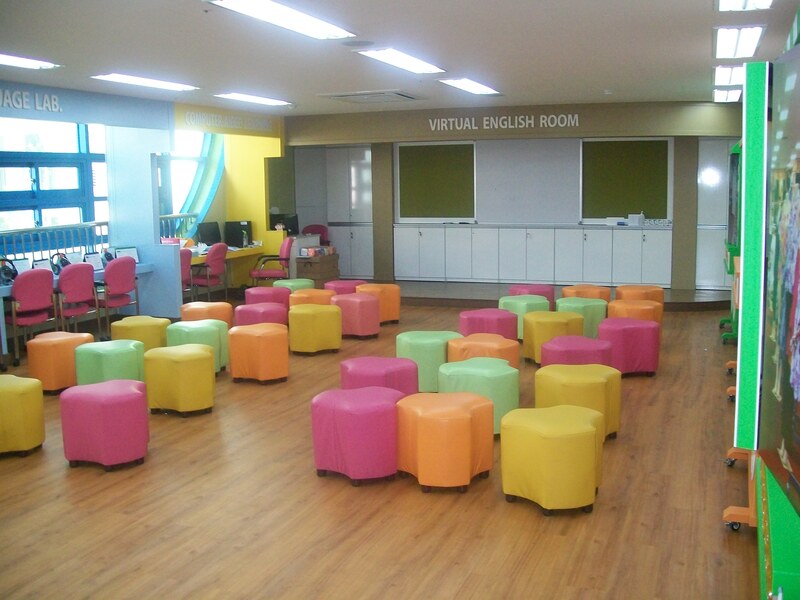 The school has two English classrooms: the English room, with desks, chairs and a whiteboard, and the English experience room, where the fun stuff happens. It has a smartboard (a type of projector that shows your computer screen to the class, and works with an interactive pen, so you can flip through slideshows, watch clips, and do all sorts of fun and interesting things) as well as many other things to make learning fun. And it’s so colourful! I spend all my time in the experience room. And not everything has to do with the computer with the super fast internet. I could dedicate a post to the internet in Korea. What else? Oh, kids are always on time. No-one arrives late. No-one gets up to do something random (vs. back home – “it’s OK to litter, but I *have* to throw away this piece of paper while the teacher is explaining this very important concept”). They don’t ask to go to the loo, they don’t forget to pay attention, they just don’t screw up in general. And they’re SMART! I’m amazed at the Korean capacity for memory retention. In my first week, I had to introduce SA. My co-teacher translated for the kids, and afterwards he quizzed the kids. What amazed me was that, after hearing my talk the first time, he could recall the Big 5, he knew the names of five of our traditional foods, and he could recite all the facts about Cape Town. (He’d probably memorised the whole thing, but that’s what he asked the kids.) This man is amazing. The kids are not far behind when it comes to learning new things. My co-teacher has done a great job of gradually phasing me in, and I’ve started presenting classes. I suspect it will get tougher (it still feels like a holiday), but I’m really lucky. Right. The syllabus. Each grade has a CD, textbook and teacher’s guide. Students get the CD and textbook. The teacher’s guide is very well set out and helpful. 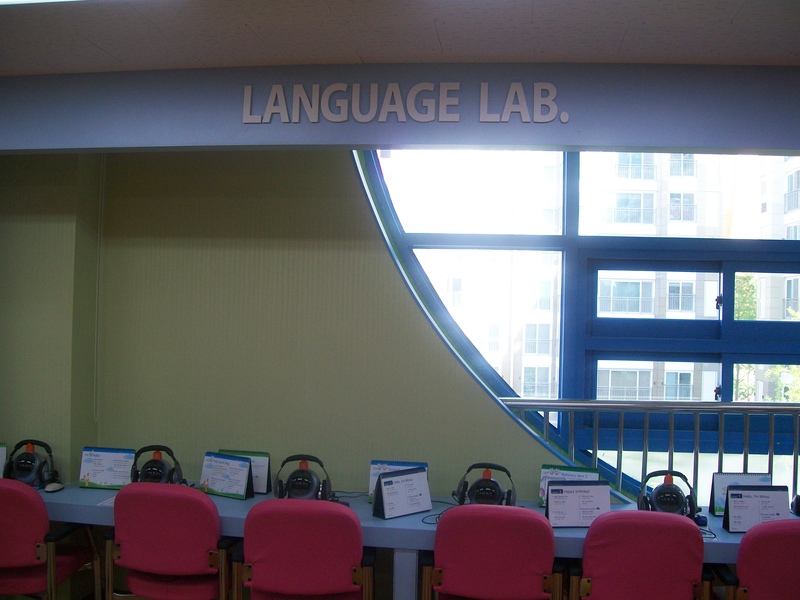 Except for the part where A LOT of the teacher-y stuff is in Korean. Everything is already divided into lesson themes, which helps with the planning. Each lesson has a key phrase, think of “I like fish”, “Don’t touch that”, “I have a headache”, etc. They learn a key phrase, and how to adapt it to other situations. Elementary English is all contextual. Yay! So the lesson starts with a review of the last lesson, then they listen to a dialogue dealing with the theme and answer a few questions. Then there are smaller dialogues to demonstrate how the phrases may be applied, and the lesson ends off with a fun activity that ties in with the theme, such as role play, reading a story, playing a board game and such. As for the horror stories I’ve heard, they include some foreign teachers having to do all the teaching, or in other cases the co-teacher translates everything and no learning takes place. My co-teacher is all about the balance. He is passionate about teaching English and he does it very well. At first I thought the kids couldn’t speak any English at all, but as they’re warming up to me, I’m realising that there’s a lot of English going on here! As an example – the kids all know “hello”, and the older groups know “good day”. One day I said “good morning” and I got very blank stares. Anyway, I was on my way down for lunch when one of the grade 6 boys walked past and said “good afternoon”. I didn’t realise the time and corrected him, nogal ewe, “no, it’s ‘good morning'”. Felt very proud of myself. He gave me a frown of disbelief and very nicely replied, “but teacher, it’s noon, doesn’t that mean I say ‘good afternoon’?” Hats off, young man! Yesterday I playfully sat on another boy’s seat and watched him panic before very nicely explaining to me that he sits there every day, and I’m new and a teacher so I should stand. I’ll come back to my newly acquired accent at a later stage. It falls under ‘Korean quirks’. I’m the first non-American foreign teacher at this school, so my accent is taking some getting used to. And let’s not even mention the speed at which us Saffas speak. I am now that person I used to tease, the one with the half fake accent. Hey man, it’s all in the name of education! Is this post becoming a bit long? No? OK. So yes, in summary: I have the best job in the world. If WordPress had an ‘insert table’ function, I’d draw a few comparisons between my last teaching job and this one, just to rub it in more. I think you get the picture. Oh oh oh – how could I forget? I love that here, the students don’t do what they’re not supposed to, and they don’t go where they’re not supposed to. Teachers lounge? Teachers only! Teachers kitchen? Teachers only! Teachers toilet? Teachers only! Teachers cupboard? Teachers only! See where I’m going with this…? And so ends my first post in Korea. It’s long weekend, and if I’m in the mood, and loaded up on all things sweet and yummy, I’ll post lots more. I have a list of things I want to write about. Might as well get started. 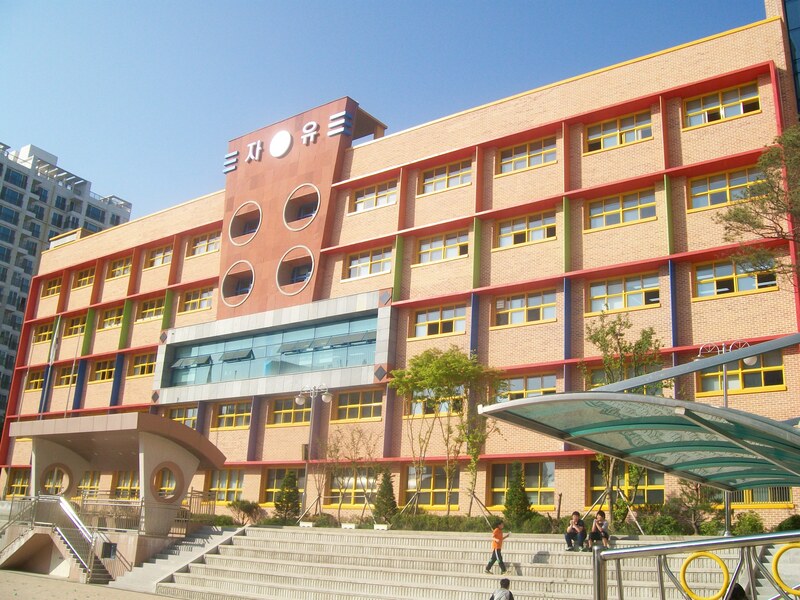 The school from the outside. My classroom. What a pleasure to work in here! Robot Doctor, an interactive program where they can practise speaking English.